The surfperches (Embiotocidae) are my true theoutershores love; it’s a nice little eastern Pacific radiation of over 20 species. On this page I show the surf-dwellers, like redtails, Amphistichus rhodoterus, and silvers, Hyperprosopon ellipticum. These are featured frequently in theoutershores blog posts. I can’t resist, however, showing off a few other common examples, like shiners, Cymatogaster aggregata, and striped, Embiotoca lateralis, from along the jetties and in the bays and estuaries of northern Oregon. Finally, I take the liberty of sneaking in a few other favorites, like pinks, Zalembius rosaceus, that I’ve been lucky enough to be in the right place at the right time to photograph. The common names are mostly those used by Love (1996). Calico surfperch, Amphistichus koelzi – You won’t come across many calicos in northern Oregon. I’ve never caught one myself, but I was hanging around, ready to snap a photo, when Mike Westphal caught this one on a central California pier. Redtail surfperch, Amphistichus rhodoterus – Redtails are kings of the surf in northern Oregon. 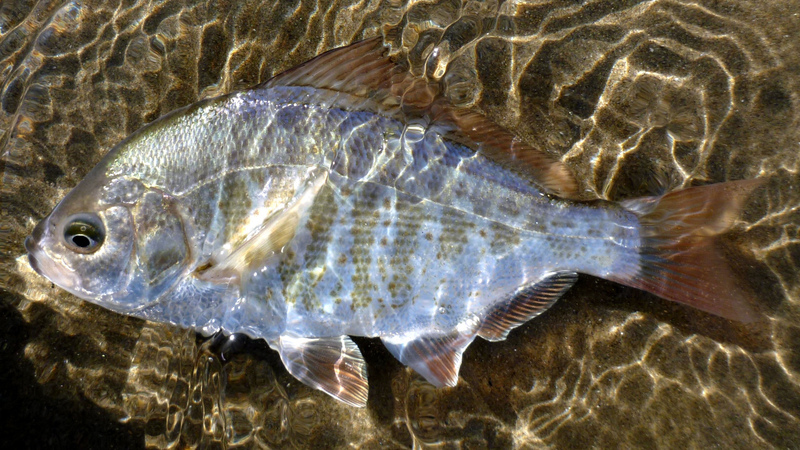 Barred surfperch, Amphistichus argenteus – Barreds patrol central and southern California beaches, and range south to northern Baja California, Mexico. Shiner surfperch, Cymatogaster aggregata – Shiners live in a wide array of habitats, but you’ll rarely find them in the surf zone. 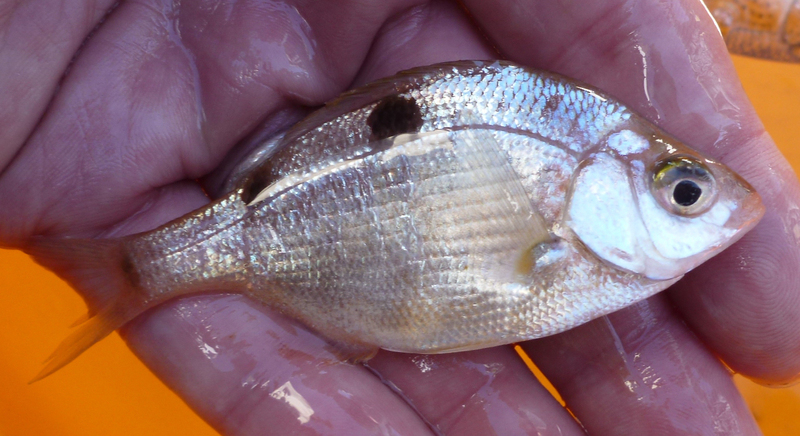 The fish shown below was part of a trawl catch aboard the R/V Point Sur, and was featured in Surfperch Summit. 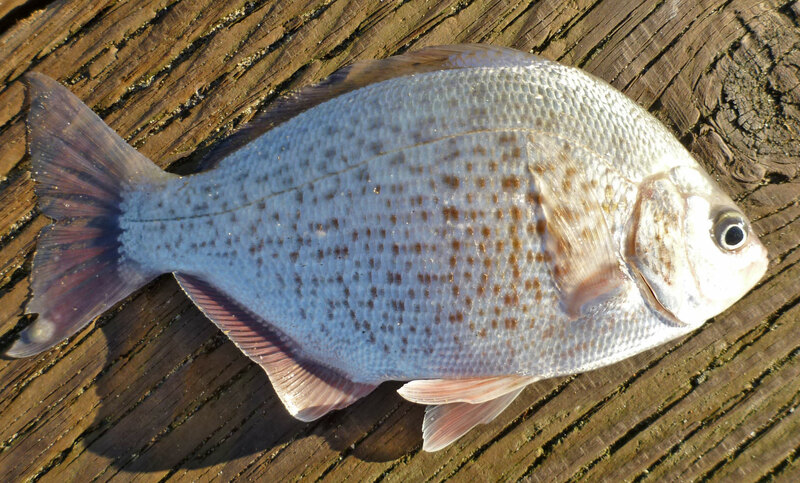 Pile surfperch, Damalichthys vacca – You won’t find “piling perch” in the surf, but every spring they cause a stir among pier the fishermen when they move into the bays. The fish shown here was featured in Enjoying Embiotocids at the Monterey Bay Aquarium. Striped seaperch, Embiotoca lateralis – Off the Oregon jetties, probably the most commonly caught embiotocid. 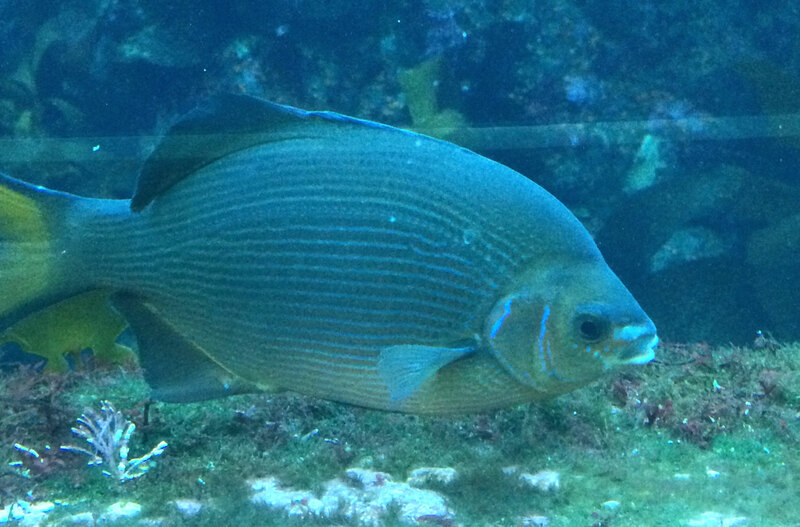 The fish shown here was featured in Enjoying Embiotocids at the Monterey Bay Aquarium. 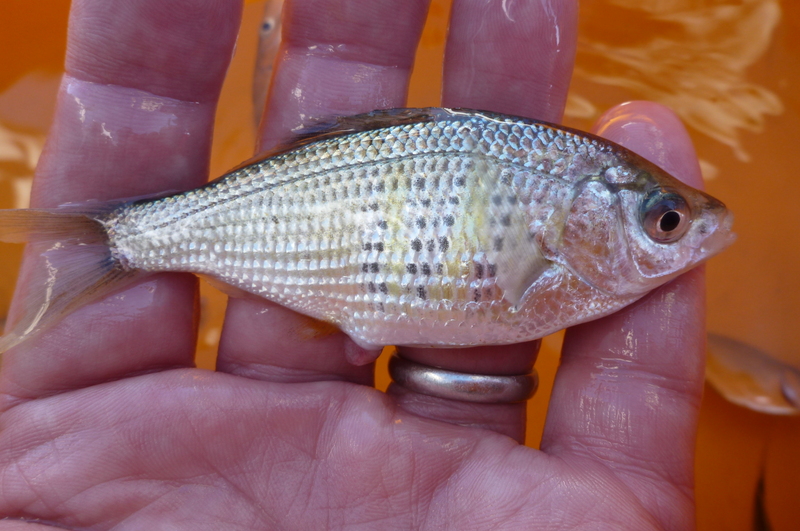 Spotfin surfperch, Hyperprosopon anale – You won’t often find spotfins in the surf zone, even where they are abundant. 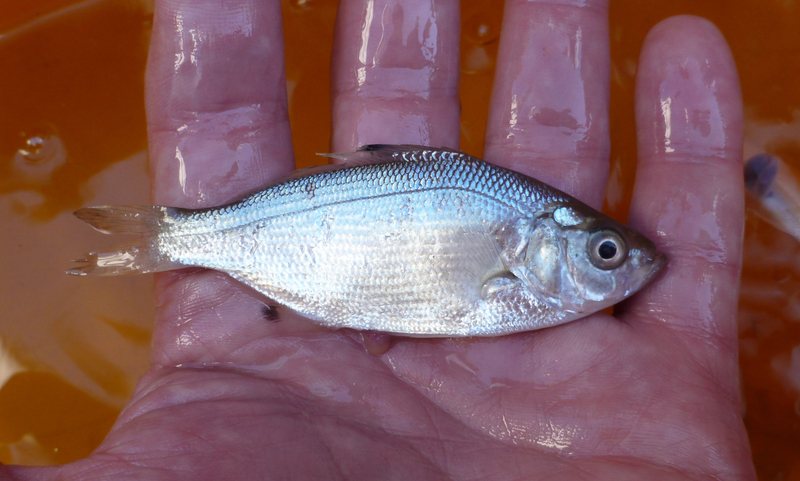 The fish shown below was part of a trawl catch aboard the R/V Point Sur, and was featured in Surfperch Summit. 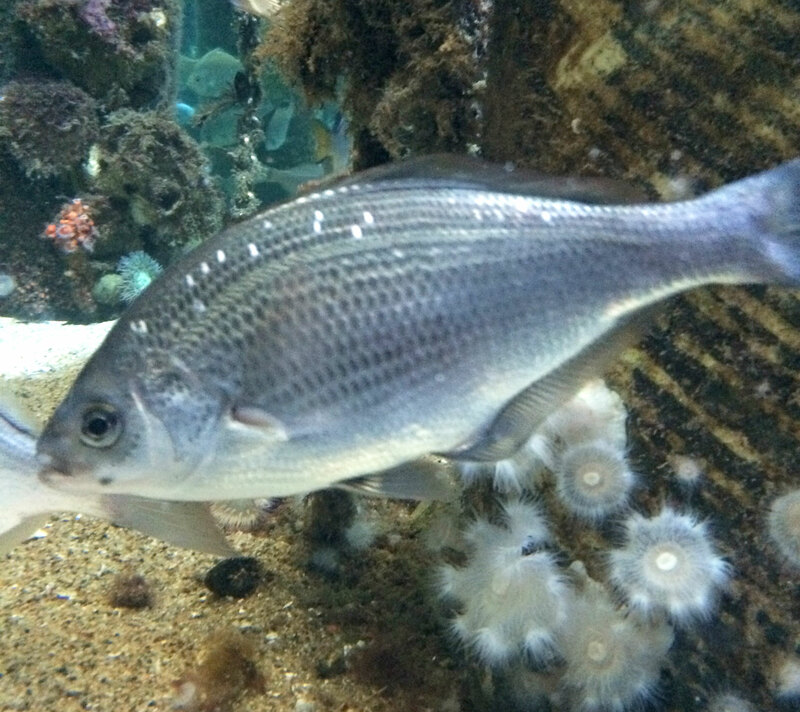 Silver surfperch, Hyperprosopon ellipticum – An abundant surf-dweller. White seaperch, Phanerodon furcatus – In Oregon, whites are rarely seen by shore anglers, until spring, when they move deep into the estuaries where they are caught in great numbers. 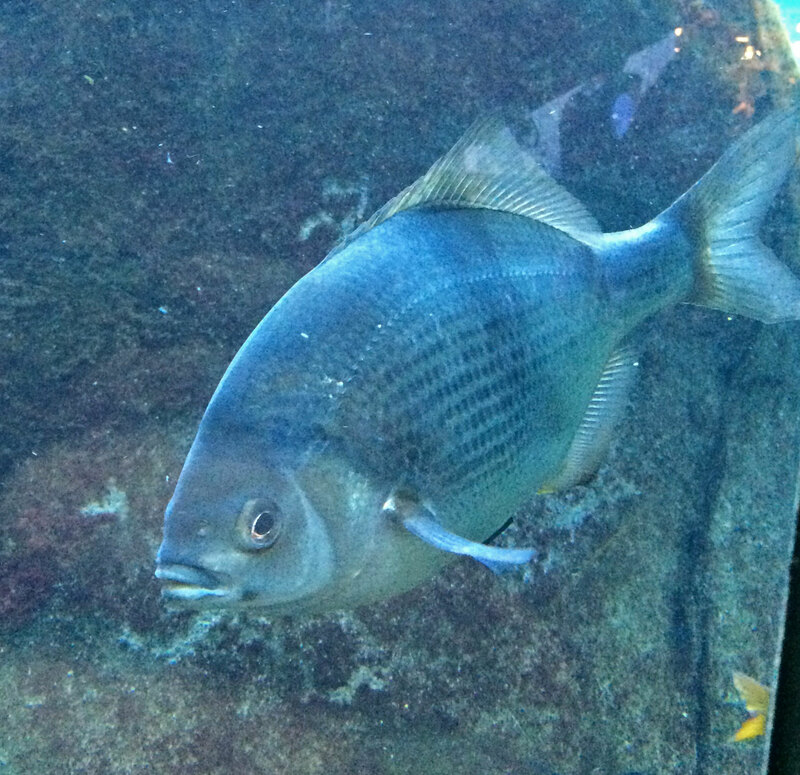 The fish shown here was featured in Enjoying Embiotocids at the Monterey Bay Aquarium. Pink seaperch, Zalembius rosaceus – Pinks don’t inhabit the surf; they live deeper than most other Embiotocids, mostly in California and Baja California, Mexico. The fish shown here is the first pink I ever laid eyes on. It was part of a trawl catch aboard the R/V Point Sur, and was featured in Surfperch Summit.